Meet Jax. Jax is a 2 1/2 year old Chocolate Labrador Retriever. 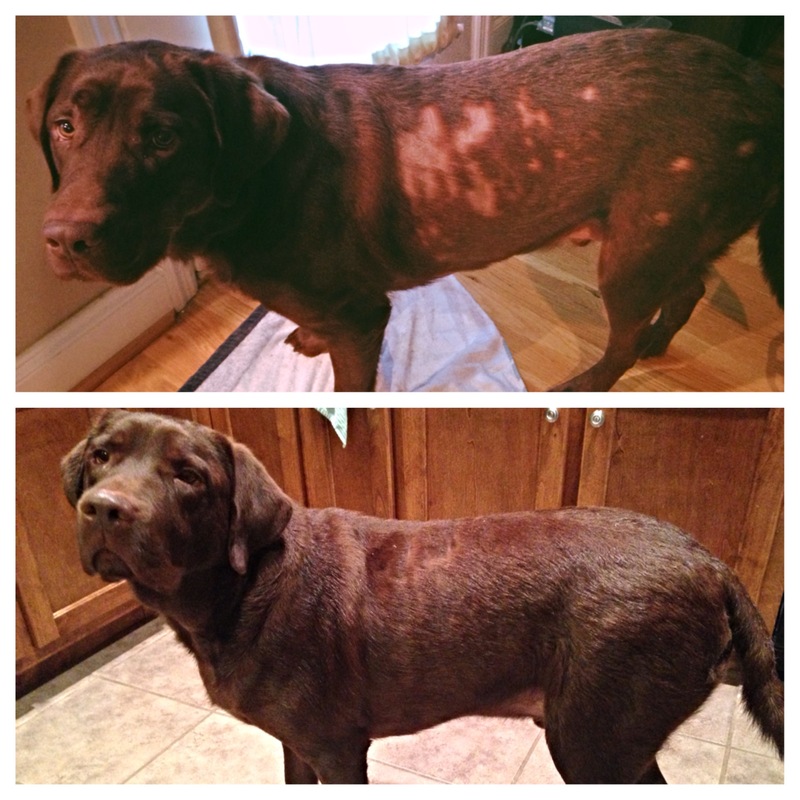 In about June of 2013, Jax started developing a skin problem. After two veterinarians, three antibiotics, and three different steroids, I had enough. After much research I realized Jax was suffering from a yeast infection. My husband and I decided to give Skin-Eze a shot thinking that it couldn’t hurt because his skin could not possibly get worse. In October 2013, we started using the all natural shampoo and herb tablets. Jax’s skin began to improve within a week. His personality and energy also improved. Of course, this testimony would not be complete without a picture to prove it. The above photo was taken in early December 2013 and the bottom photo was early January 2014. Keep in mind that the other side of his body looked exactly the same. His hair is still coming in, but the yeast is still gone and we plan on bathing him only with Skin-Eze for the rest of his adorable doggy life. I have a quick question I wanted to ask you about your blog. Do you think you could send me an email when you get this? Try the new medication Apoquel, my dog has chronic allergies which of course turn in to skin issues. I tried everything, nothing worked until this. I promise this problem will be a thing of your past. Researched Apoquel and findings were not good! See below, side effects! Would not recommend this drug at all. I bought the supplements for my dog who has pink itchy bumpy skin. The dose was way too much for him to handle and it gave him bad diarrhea. After two weeks of trying to stay on it, I had to discontinue the Skin Eze. I was so disappointed. I have never had a dog with skin problems.. and I don’t want my new rescue on any medications long term. My vet keeps pushing steroids.